Disclaimer: I received a copy of this book via NetGalley in exchange for an honest review. This was a really good book but I felt like it should have ended at about 70% after the confrontation at the ball. There was much to like about it but after the ball, it fell kind of flat. I feel as though I had a lot of expectations for this book but it did not deliver -- at least not in the way I was hoping. The plot dragged and was slow -- if it hadn't been so interesting, I probably wouldn't have continued to read it. It wasn't until 50% through the book that Georgiana learned about the true nature of the "school" and after that she didn't get any of the same training or treatment as the other girls. I also felt as though there was some off-screen drama that happened between Tess and Daneska that was never truly spoken about, but that was extremely important to understand the characters. Maya was barely featured and was probably the most interesting character of them all. Also, there was never an explanation as to why some of the girls had these extraordinary powers, such as seeing into the future and knowing the present, but not all of them had it. As well, since Daneska was a part of the "unusual girls" but was no longer part of that, it was confusing as to why she was even originally part of it, since that was not explained. I understand it is a series, but I think since it was mentioned, it should have been at least semi-explained but there was not enough explanation in the novel about it. I did like the "romance" because it was a slow buildish; however, I did not like the whole "oh he teases you so he likes you" thing and how "that is just how men behave" no. Stop that. Stop feeding girls that line. I also liked the historical attributes of this one. 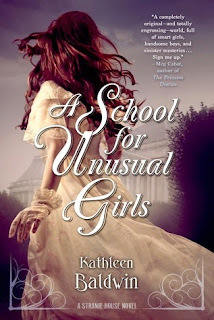 Unlike some other historical fiction young adult books I've read, this one actually felt as though I was in the time period and the book didn't have to remind me that it was not modern times. I also enjoyed the science pieces of this novel, especially since so often heroines are very literary inclined, but Georgiana was scientifically inclined, which I thoroughly enjoyed. The writing style was on to get used to, but once you got into some of the "action" scenes, it made it a lot easier to understand and enjoy. I almost want to reread the first part now that I am used to the writing, but it was so boring that I think I am pretty content with how it is imagined in my mind. Overall: 3.5/5. For an interesting plot and hopefully more of an explanation of training and things in the next one.